THE RUBY CIRCLE brings Richelle Mead’s fantastic Bloodlines series to its conclusion. Sydney and Adrian are living with the consequences of their actions at the end of SILVER SHADOWS, but things don’t seem to be going anywhere and they feel trapped. That is, until an unexpected arrival sets a chain of events in motion. I have been looking forward to seeing how Mead would conclude this series since I fell in love with the first book BLOODLINES. There was just something about Sydney Sage that made me want to read her story – I even read Mead’s Vampire Academy series so I wouldn’t miss any plot threads – and I thought Adrian, Jill, and Eddie were intriguing. THE RUBY CIRCLE was a book I approached with excitement and dread – just how would Mead end things? I really enjoyed following Sydney and Adrian’s final adventure. Mead did a brilliant job in wrapping up the series – although the ending does make me hope that she will venture back into this world. There is a lot going on in THE RUBY CIRCLE, lots of different plot elements; Mead did a good job in making all the different threads easy to follow. The over-arching plot ties off the thread from the end of SILVER SHADOWS in a way I did not see coming. Mead also provides lots of other little threads – like will Sydney and Adrian get their HEA? – which tease the story along. 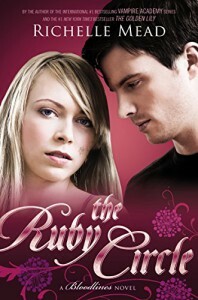 As with the previous book, THE RUBY CIRCLE is narrated by both Sydney and Adrian – they narrate alternate chapters. This really worked for me as it allowed me to see more of what was going on to the overall plot and it allowed an insight into both characters. Rose and Dimitri make an appearance in this book, so fans of Vampire Academy series will gain a little look into their lives. Familiar faces from previous books in the Bloodlines series also made a return which was awesome. There was a lot going on in this book, but Mead still managed to sneak in some intimate moments between Sydney and Adrian. THE RUBY CIRCLE is a superb conclusion to the Bloodlines series, well worth a read if you have enjoyed the series so far.